1. In a bowl make a batter of maida, besan, curd together. Add little water if required. 2. For chashni or sugar syrup, add sugar and 1 cup of water for boiling till it thickens to 1 thread consistency. Add kesar in syrup to enhance the flavor. Allow the sugar syrup to cool down. 3. 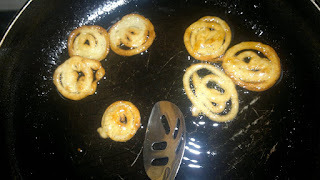 In the jalebi batter add ½ tsp of eno just before frying. 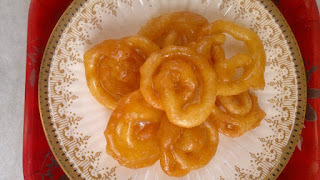 Pour the batter in jalebi maker. Heat up the oil for frying. Deep fry the jalebi on medium flame. Once a golden colour is achieved, remove the jalebi from the oil and soak jalebi in sugar syrup for 1 min. 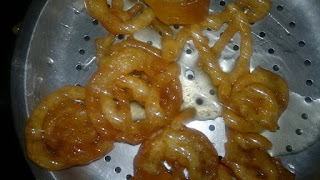 Then take the jalebi out and put on perforated plate to remove the excess the syrup. 4. Serve hot with rabri or have it just like that.